Two topics come to mind when I think about this image: “bad” light and cropping. Light: Yes, all photographers know that the best light is usually early in the morning (just before and after sunrise) and in the evening (just before and after sunset). However, that does not mean that you can’t take good photos during the middle of the day. I didn’t do a whole lot to this photo to enhance it, other than to add a little bit of a warm glow effect. Cropping: Depending on your camera, the photos you take are probably in a 3×2 format (SLRs) or in a 4×3 format (compact cameras), but you don’t always have to keep that aspect ratio. The high megapixel count of almost all digital cameras these days means that you have plenty of room to crop, and still end up with a high resolution image. 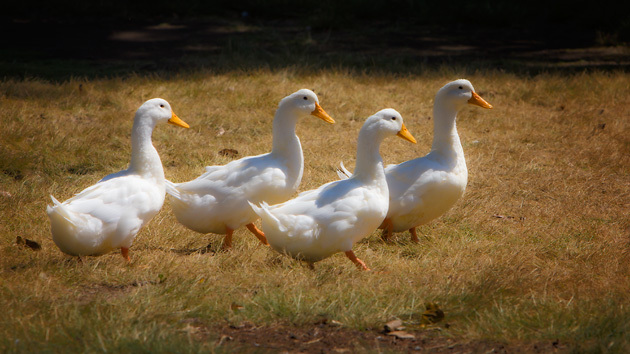 In this image, the line of geese begged for a more elongated format, so I cropped it to a 16×9 ratio (which is incidentally the ratio of widescreen TVs and many computer monitors). I wanted a little space in front of the geese (i.e., at the right edge of the photo) into which the geese can walk in the viewer’s mind. However, I didn’t want more “negative” space above or below the geese. So, the next time you look at an image of yours that doesn’t seem to quite match the default format of your cameras photos, try experimenting with different aspect ratios. This entry was posted in Picture of the Week and tagged canon eos 60d, cropping, geese, light, nature, outdoors, photography. Bookmark the permalink. I love the progression of shadows, right to left, large to small, on the bodies of the birds. This causes the eye to move along the line of geese, almost suggesting motion. The limited color palette also gives the photo an air of antiquity that I personally like.